this is a product line that our entire company is excited about. The Betty Mills Company ® an Internet TOP 500 Retailer and the one of the nations’ leading suppliers of all natural, organic and healthy snacks today announced the product launch Umpqua Oats at BettyMills.com. Betty Mills CEO, Victor Hanna said, "We love bringing healthy options that taste great to our customers and this is a product line that our entire company is excited about. 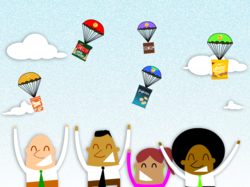 It's also a great addition to our Snack Rewards™ program in which our customers get their snacks free." "We are excited about working with Betty Mills and their Snack Rewards program. This will enable Umpqua Oats to broaden its reach into corporate break rooms and provide healthy alternatives for those seeking a more nutritious morning or afternoon meal,” said both Sheri Price and Mandy Holborow, Co-founders of Umpqua Oats. The Betty Mills Company® is a TOP 500 e-commerce company and one of America's leading B2B suppliers of cleaning, facility, break room and office snacks. Offering 130,000 brand-leading products shipped right to your door from over 55 U.S. warehouse locations. With Betty Mills everyday low prices, Snack Rewards™ Customer Loyalty Program and Double Markdowns® Specials, Betty Mills offers a comfortable and easy online shopping experience for everyone who likes to buy smart and save big! Betty Mills Company's headquarter is located in San Mateo, CA. For more information, please visit BettyMills.com. From the best natural ingredients to the unsurpassed taste, Umpqua Oats is truly the Nutritious, Delicious and Fast breakfast choice. Umpqua is not only proud to have created a healthy alternative meal on the go, but they have changed the traditional oatmeal stereotype. People who don’t like oatmeal, admit to being shocked when they turn out loving the product! The Betty Mills Company .